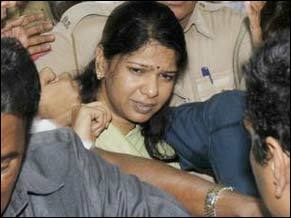 DMK MP Kanimozhi and 4 others were granted bail by the Delhi High Court on Monday 28 November in the 2G spectrum case. This was Kanimozhi's fifth attempt at bail. It has been six months since she was arrested. The court heard the bail pleas of former Telecom Secretary Siddharth Behura, filmmaker Karim Morani, DMK-run Kalaignar TV MD Sharad Kumar and private firm Kusegaon Fruits and Vegetables Pvt Ltd director Rajeev Agarwal and Asif Balwa of DB Realty. All four, except Sidhharth Behura, were granted bail on Monday. Behura's plea was opposed, saying being a public servant he misused his position. Former telecom minister, A Raja said that he would not ask for bail. He says he wants to demolish the court case against him. Two others who are still in jail are R K Chandolia, former telecom bureaucrat and Shahid Balwa, a promoter of Swan Telecom. Of the 14 people being tried for charges from criminal conspiracy to forgery, 10 have now been granted bail. 0 Response to "Kanimozhi and 4 others get bail in 2G spectrum case"